Tessuti Fabrics, founded by Colette Guanta and Greg Spirou, first opened its fabric stores in Chatswood Sydney in 1992 and has become well known in Australia as the home to some of the world’s most beautiful designer fabrics. Its customers appreciate the quality of the product and personal, caring service from the staff, who all have a great knowledge and understanding of sewing and fabrics. Over the years, we’ve redesigned and rebuilt the website a couple of times, each time evolving the design, the brand and the performance of the website. We’ve worked closely with the Tessuti team, looking at ways to grow the audience and get their great fabrics to as many customers as possible. ‘Tessuti fabrics‘ – currently in the first position. ‘Sydney fabrics‘ – currently in the first position. ‘Melbourne fabrics‘ – currently in the first position. The user experience was also a key consideration of the main website. It needed to have easy access to shop locations, trading hours and other fabric store specific information. The latest design is clean and fairly minimalist, allowing the customer to easily browse the site and find the information they need. Building an online sewing community. Colette Guanta started the ‘Sew Tessuti‘ blog in November 2007 which has become without a doubt, Tessuti’s greatest online asset. The blog is Colette’s personal creation, examining whats new in store, fashion trends, pattern reviews and sewing tips. Colette has managed to create a sense of community around the Tessuti brand by inviting visitors to send in photos of their own creations. There are so many reasons why the Sew Tessuti blog works so well for Tessuti Fabrics. The choice to host the blog away from the main Tessuti website creates a sense of community around a personal blog, rather than appearing to be a corporate/company presence. It also allows page rank to flow between both sites (great for search engine optimization). Colette also writes about a wide variety of subjects, not just Tessuti propaganda, so it is genuinely interesting to visitors. The blog receives a large amount of return visitors because of this. 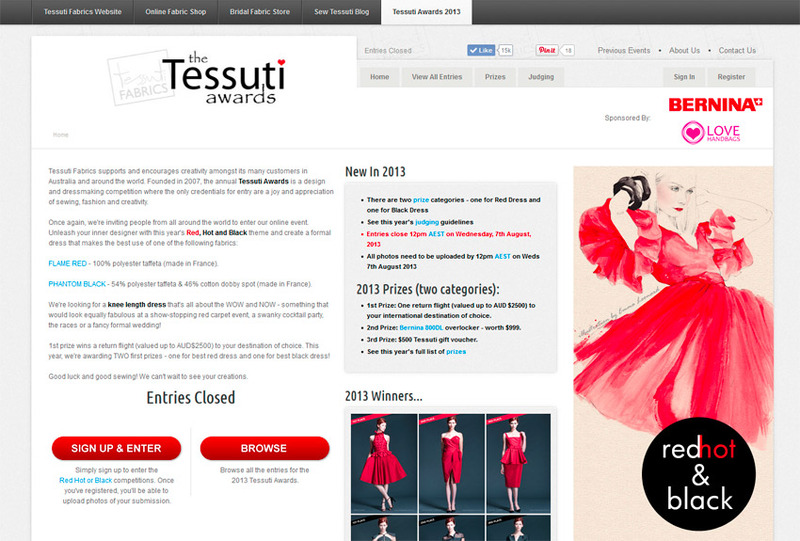 In 2007 Tessuti created a home sewing / fashion competition, to engage the sewing community and generate brand awareness. The competition was help in store at Surry Hills. In 2008 we were hired to create the Tessuti Awards website, a portal to information about the upcoming event. The site was a fantastic success, both before and after the event, driving traffic to all of the Tessuti websites. The competition has been an annual event since. Tessuti expanded, opening a shop in Melbourne. Their online pressence made this easier, by getting the sewing community engaged, before the Melbourne fabric store even opened. 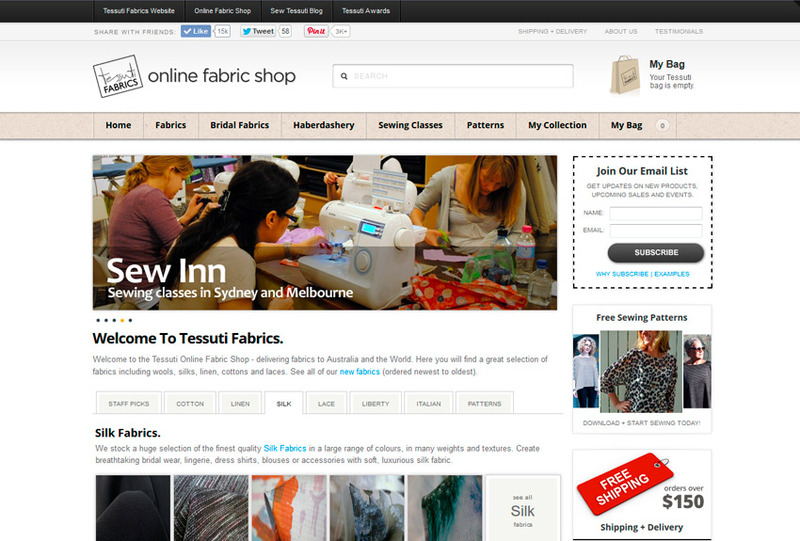 The next step in Tessuti’s online evolution was the creation of the Tessuti Online Fabric Shop. It was often suggested in the Sew Tessuti blog that fabric be sold online, so that people from beyond Sydney could buy the fabric that they were reading about in the blog. We initially weren’t sure if Tessuti’s customers would buy fabric online, as its a product that is best seen and felt before a purchasing decision is made. However, in 2008 the online fabric shop was launched. With good photography and descriptions, we (both Tessuti and the web development team) were positively surprised at just how successful the online shop has become. Tessuti now sells fabric worldwide through its online shop, reaching customers who would never have heard of the Tessuti name if not for the great web pressence. These customers would never have been able to get to one of the Tessuti shops, so the online shop has opened them up to a whole new market. Tessuti’s growth is now potentially unlimited, reaching customers well beyond the city limits. The online shop now also sells sewing classes that are held in their fabric shops, as well as digital downloadable sewing patterns. Tessuti really have been a dream client, both of us working in creative industries – it was really easy to form a genuine connection. They invited us in to fully understand their business (not just online, but the whole business) and we’ve all enjoyed building on our shared knowledge and experiences to create something successful. And to think it all started with a simple redesign of their original website!